It is now 9:46 AM PT Time on Wednesday, April 24, 2019. FACILITY: 50-meter championship pool set up as two 25-yd courses, each with 9-ft wide lanes and a water depth range of 9’-10.5’ Continuous warm-up available in 7-lane, 25-yd dive tank. The length of the competition course is in compliance and on file with USMS in accordance with articles 105.1.7 and 107.2.1, but as a bulkhead course, is subject to length confirmation. Eligibility of times for USMS Top 10 and Records will be contingent on verification of bulkhead placement. TIMING SYSTEM: The primary timing system will be automatic timing (Omega). Times may be submitted for USMS records and USMS Top 10 consideration. TIMES: Schedule is the same for both days: Warm-up 9:00 - 9:50 am, meet starts at 10:00 am. 10 minute break after Event #5, on Saturday, and Event #17, on Sunday. RULES: Current USMS rules will govern the meet. Strictly forbidden: Using hand paddles, fins or kick boards in warm-up areas; Diving in warm-up areas unless in designated sprint lanes. ELIGIBILITY: Open to all 2019 USMS or foreign registered swimmers 18 and above as of 04/14/2019. Age groups based on the swimmer’s age as of 04/14/2019. If not a member of USMS or MSC, please bring a copy of your 2019 registration card. ENTRIES: Individual Entries: Swimmers may enter up to 6 individual events, 6 individual events/day max. Individual and relay-only swimmers must register online by 11:59 PM (Pacific) Sunday, April 7th, 2019 or mail a paper registration form postmarked on or before Wednesday, April 3rd, 2019. No day of race or late entries for this meet. Coaches will be provided relay cards at the meet. ENTRY FEES: $35 (US) surcharge for individual and relay-only swimmers. PLUS $4 per individual event. PNA swimmers who need financial assistance for entry fees may request same from PNA Wiggin Fund. No splash fee for relays. SEEDING: Two courses will be used for the 500 Free, 1000 Free and 1650 Free, depending on entries the 400IM may be swum in two courses. A single course will be used for all other events. All events slow to fast. Pre-seeding except for asterisked events, below. Sunday: 500 Free – 9:30am, 1650 Free – end of Event #18. Swimmers missing the check-in deadline will be scratched from the event. RELAYS: 18+, 25+ and subsequent ten-year increments as needed. Age of the youngest member of the relay team determines age group. Mixed relays require two men and two women. Relay entries due by noon each day of the meet. Relays entry info above. AWARDS: Ribbons for individual places 1 – 6. Medals may be purchased at meet. Plaques will be awarded for PNA team awards. 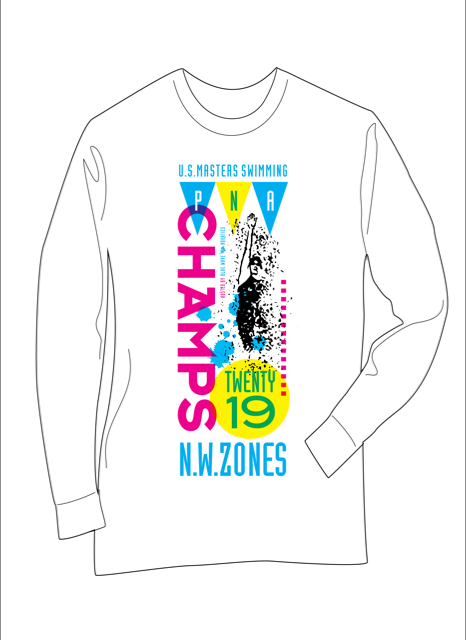 T-SHIRTS: Championship long sleeved technical shirts are for sale during registration, we will have a limited number of t-shirts at the meet. Guarantee you get the right size by ordering your Championship t-shirt when you register today! The event will take place immediately following the conclusion of Saturday’s swimming events at the Aquatic Center complex banquet hall, which is adjacent to the pool. The social will feature a delicious meal at $15/person. A no-host selection of beer, wine, and non-alcoholic beverages will be available (cash only). Tickets for the event are required; sign-up when you enter the meet. If you are not entering the swim meet, contact PNA President Sally Dillon at salswmr@comcast.net to purchase ticket/s. A continuous video of PNA swimmer’s accomplishments over the previous year will be shown and the Coach of the Year and Dawn Musselman Inspirational Service awards will be presented. PNA board members will be on hand to conduct a brief meeting, which will include discussion and an opportunity to ask questions. DIRECTIONS: From North or South Bound I-5 take exit 142 B. Proceed west on South 348th St for 2 miles. South 348th changes to SW Campus Dr. at 1st Ave. The pool is on the right. Online Registration closed on 4/7/2019.